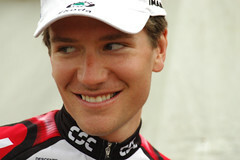 US time trial champion and former Tour yellow jersey David Zabriskie has signed the UCI's Riders' commitment to a new cycling. Cyclingnews.com reports that Zabriskie becomes the 4th American to sign, after Credit Agricole's Saul Raisin, T-Mobile's Aaron Olson, and Tyler Farrar of Cofidis. Update: The latest provisional start list at Cycling4All.com has 7 CSCs confirmed: Arvesen, Cancellara, Kroon, O'Grady, Sastre, Schleck, and Voigt; and says the final 2 riders will come from Lars Bak, Inigo Cuesta, Bobby Julich, or Nicki Sørensen.